Ho, ho, ho! 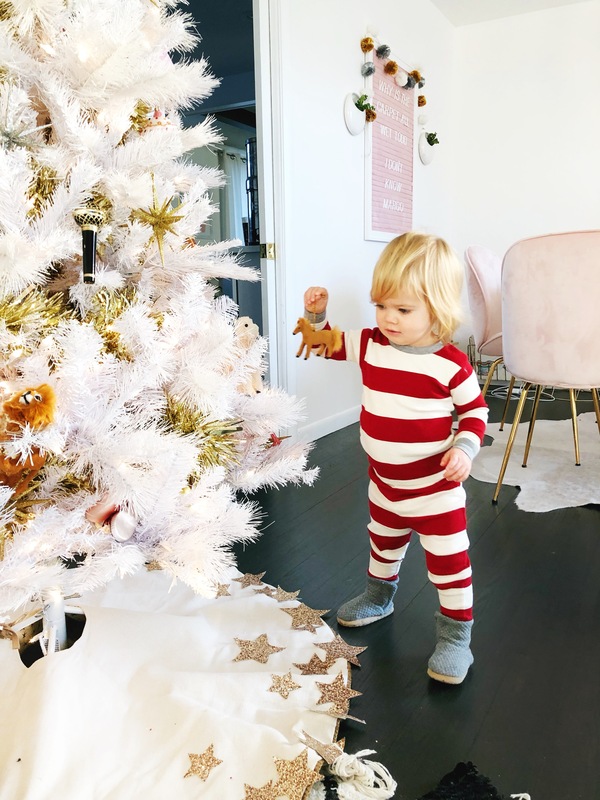 Santa will be here soon and I’ve been busy gathering presents ideas for Lola, dressing her in holiday pajamas, and imagining how delighted she will be with some of the small things I’ve gotten her (like kitty sticker sheets!). I’ve been hiding them in my office and I’ve compiled a little present hoard for her that I can’t help but keep adding too. Here are a few other things I’ve been eyeing for her lately! I think I need some of these to go under Lola’s dresses—I used to have some when she was smaller and they are so helpful as it kind of ruins a cute look to see a diaper underneath if you ask me! Now that Lola is a little bigger, she needs silverware that’s a little bigger too so I ordered these stainless steel utensils (we also used the baby size set with her too) and these deeper spoons for soup. All toddler spoons are too shallow for soup and our normal size spoons are still too big for her mouth so we’ll give those a try instead! Deciding between this and this dress for Lola’s New Year’s Eve dress! Which do you think? I don’t know if she would keep them on this winter, but she’d be so cute in these! I wasn’t sure she would wear a scarf, but it looks like this one loops through itself so I feel like there’s a much higher chance of it staying on. Lola’s been grabbing the microphone ornament off the tree to sing into it so I made her a wooden version and she loves it! You can also buy one like this if your little one loves to jam out too. This patchwork fur coat! Or this tone on tone blush one is so good too. We went into Pottery Barn Kids to buy a present this weekend and she went straight for this tea set and started pouring the tea and pretending to drink from the cups which totally blew me away! I can’t believe how much she totally understands and can mimic already—it’s amazing. Bought her this sweet reusable sticker book as a stocking stuffer—she’s so in to stickers right now but she wants them to all be reusable (which they haven’t been) so I think this will be a big hit! Also, I just bought these stacking dolls for a last minute stocking stuffer and I know she will love them—Todd’s Mom has a few sets at her house and Lola thought they were so cool. Uh, love these boots and they actually look warm too which is a big plus. These little slipper socks I got to keep her feet warm around the house are great and so are those grey ones in the photo above, but she’s grown out of her warm outdoor boots so I’ll have to add some of those in her size soon. I know this time is about so much more than presents, so I’m soaking in all the “free” joy that comes with the season as well and I hope you are too! Categories: Baby, Oh Baby | December 14, 2018 by thebandwifeblog. She’s so tall in this picture, wow time has flown and she looks like a big girl now. Love the stars dress and 2nd fur coat the best. I bought my 2 year old this Green Toys tea set for Chriatmas to replace her tin tea set because she keeps putting all her snacks in her tea cups and sauces to eat. The Tin sets aren’t food safe but the Green Toys sets are. They’re made entirely from recycled milk jubs and BPA/ phthalate/PVC. Might be worth considering if you think Lola is going to try eat/drink from them eventually. Green Toys is considered one of the best non-toxic toy brands in the US and they have super cute dish sets too. Oh nice! I did see that set there and thought it was cute, I hadn’t thought about her eating real food from them but I guess that’s good to think about! Those striped jammies are too cute!!! Both of those choices for dresses are adorable! She is so adorable in her jammies…. well in everything. 🙂 I love the lil dress with stars on it.